Continuous inkjet printing is an established technology that has been around for 150 years. Simply put, it is a method of droplet generation where once the print head is running there is a continuous stream of fluid. Although this concept was first patented by Lord Kelvin in 1867, the first commercial devices appeared more than 80 years later, in 1951 by Siemens. Initially the technology was used for high speed, contact-less printing of variable information such as expiration dates, batch codes as well as names and product logos. Continuous inkjet printing begins with a high-pressure pump that directs liquid from a reservoir to a bank of micrometer-sized nozzles, thus creating a continuous stream of droplets at frequencies determined by the oscillations of a vibrating piezoelectric crystal. For printing applications specifically, ink droplets are being deflected from the continuous stream due to the presence of an external electric field. This generates patterns on the surface of a printing medium. Some of the advantages of this technique are high throughput, high droplet velocities, increased distances from printhead to substrate, and no nozzle clogging due to continuous operation. Thanks to these positive attributes, this technology has, nowadays, evolved from regular printing ink on paper to depositing a variety of materials (even living cells), to creating modern OLED (Organic Light Emitting Diode) displays. In this blog, I will discuss the physics behind continuous inkjet printing, followed by the FLOW-3D simulation studies conducted by Ioannis H. Karampelas, CFD Engineer at Flow Science. Further advancing his work, I ascribe randomness to the droplet generation process, inspired by the application of inkjet in the OLED printing industry, and illustrate the variation in the resulting droplets. 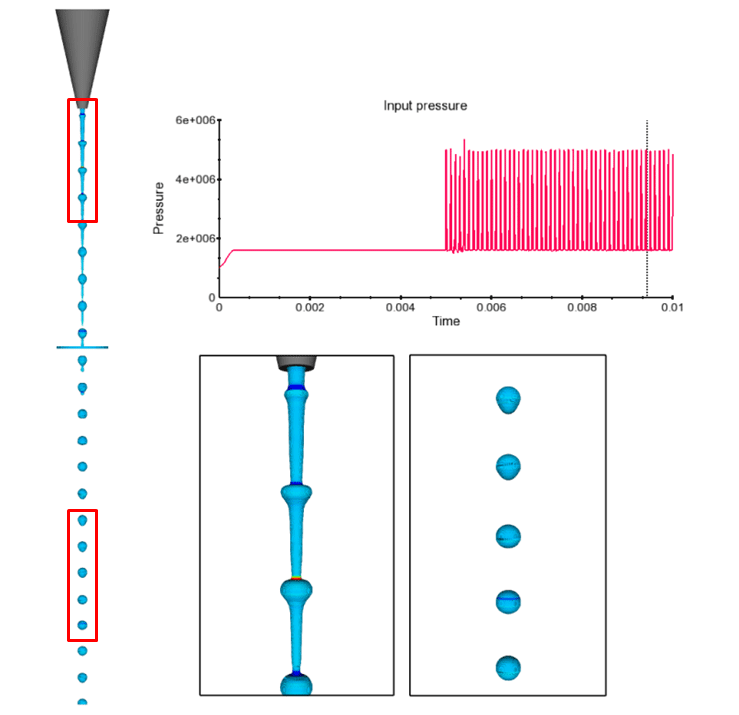 Using the theory above and known industrial parameters, a nozzle radius of 125 μm and a frequency of 10 kHz was used while setting up the computational model in FLOW-3D. FLOW-3D is well-suited for simulating droplet based processes, such as continuous inkjet printing, because of its powerful and accurate surface tension model. In the simulation results below, we can see the input pressure pulse, oscillating at a frequency of 10 kHz. The average droplet size is around 240 μm, which is in good agreement with the theoretically estimated droplet size of approximately 250 μm. One approach to resolve the mura problem is to use the law of averages. What this means is to randomly combine drops from different nozzles (intra-pixel mixing) to average out the positive and negative errors in droplet volumes, thus forcing the droplet volume error towards near zero. In order to simulate this process of intra-pixel mixing in FLOW-3D, some randomness was added to the input pressure pulse amplitudes. The magnitude of the maximum fluctuation was set to 200 kPa, on top of the original pressure amplitude of 1.7 MPa. The animation below shows a comparison of the case with randomness versus the initial case without randomness. Animation comparing the case of randomness in pressure pulses versus that of constant amplitude. As expected the droplet generation is not uniform in terms of droplet shape, droplet size, inter-droplet spacing and the flight velocity. The constant amplitude case on the right however generates evenly spaced droplets of uniform shape and size. In this blog article, FLOW-3D was used to promote an understanding of the physics involved in continuous inkjet printing processes. Thanks to its powerful surface tension model, FLOW-3D can also be useful in a variety of advanced droplet generation and deposition applications. In the case of OLED printing for example, FLOW-3D can be effectively used to understand the variations caused in droplets during intra-pixel mixing, resulting in better quality of OLED panels. Please contact me at adwaith@flow3d.com for more details, suggestions or an idea for a similar case study. Madigan C. F., Hauf C. R., Barkley L. D., Harjee N., Vronsky E., Slyke S. A. V., Advancements in Inkjet Printing for OLED Mass Production. Kateeva, Inc.